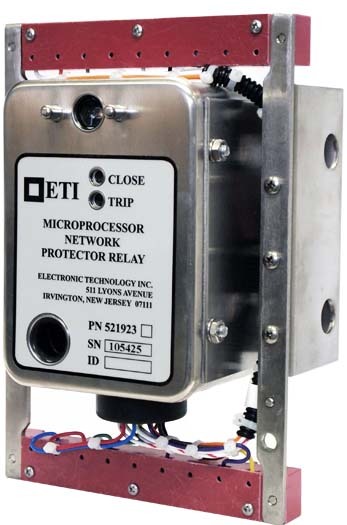 ETI MNPR® is a direct replacement for electromechanical and solid state relays in existing or new Westinghouse and General Electric Network Protectors. The MNPR® offers a single solution incorporating all features: sensitive, insensitive, time delay, instant, watt-var and inverse watt-var. Real time, three phase data acquisition and calculations, direct readings of network voltage, differential voltage, current, phase angle, and temperature are available. Waveform capture allows complex harmonic analysis and display. The Commander App and FieldPro PC software are available for remote and local operation and programming. Two way communications for control and monitoring are available via cellular modem, radio, fiber optics, and phone lines. Standard and custom protocols are available with data integrity and security. Communication data concentrators can be used to maximize system information rates.